The number of Indian students going abroad to study grew by just under 18% last year, marking a second year of strong growth in outbound numbers. 2015 was also the second straight year in which growth from India outpaced that of China, and these two key sending markets continue to have a profound impact on overall enrolment trends in major destination countries. The report makes the point that Chinese and Indian students together account for nearly half of all international enrolment in the US, and roughly four of ten foreign students in both Canada and Australia. India has also emerged as an important growth driver for key destinations. 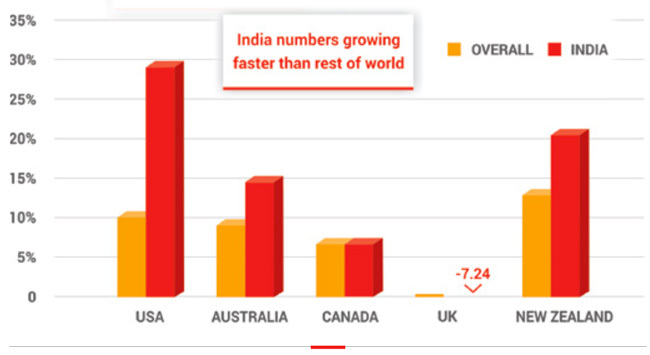 With the exception of the UK, the pace of growth in Indian enrolments was greater than the overall growth rates recorded by the US, Australia, Canada, and New Zealand. If this trend persists it will indeed see India playing a more important role in driving overall enrolment levels, particularly if the slowing growth that we have observed in China over the last two years continues as well. The US alone saw just under 30% growth in Indian enrolment (29.4%) last year, with Indian students accounting for 13.6% of all foreign enrolment in America in 2015. Looking behind the numbers, there was a significant event in last year’s enrolment in that undergraduate studies also saw a big surge. After five consecutive years of declining undergraduate numbers from India, the US saw a 30.3% increase in Indian undergraduate enrolment in 2015 – the first time in several years that Bachelor degree students even came close to keeping pace with the skyrocketing growth in graduate enrolments (which were also up 39.3% in 2015). Outside of the major English-speaking destinations, China and Germany are both taking shape as important emerging destinations for Indian students. While overall student volumes for both remain relatively modest (11,655 Indian students in Germany and 16,694 in China in 2015), their year-over-year growth rates are impressive and each saw growth of 23–24% last year alone. This entry was posted in Asia, India, Regions and tagged indian students in Australia, college admissions, indian students in Germany, indian students in New Zealand, higher education statistics.